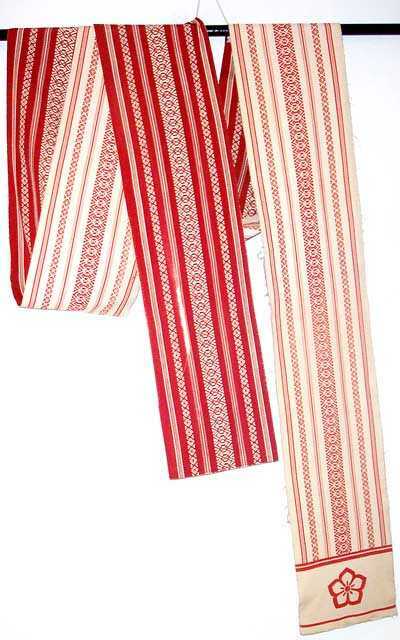 The Hakata Ori Maiko obi is beautifully woven in red and white. 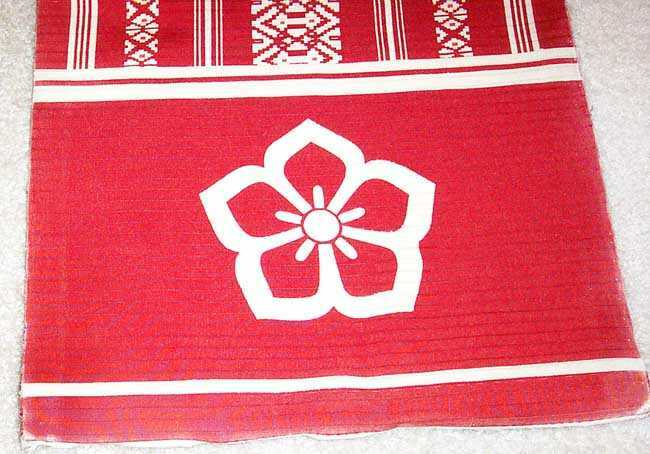 This obi is reversible and can be worn with either side facing out. The Hakata Ori Obi is made of a thick plain-woven silk covered with a gauzy silk fabric. The cloth is woven just for the obi. It is said to have a unique rustling sound when worn. A Maiko would attract lots of attention in this obi. The Hakata Ori is known for its luster and strength. 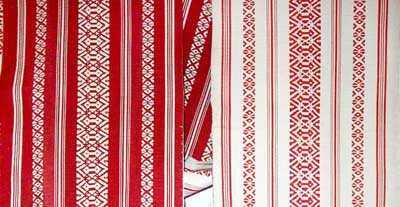 Raising the warp after the weft is strongly woven in the compacted warp creates designs of stripes and symbols. It is said the design was introduced in Japan about 1300. 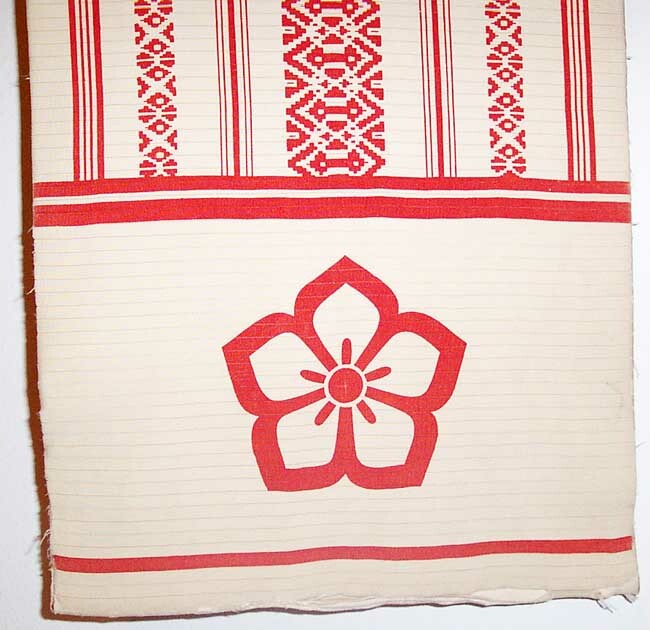 History tells us that feudal government regulated the number of Hakata Ori weavers. There were never to be more than 12 weavers. This was done to maintain the quality and keep the cloth exclusively for the rich. We purchased this great obi from our friend in Kyoto. She is a retired Geisha and owns a Maiko dressing service. She said it would look great with the Bingata Miako kimono. We agree, they were meant for each other. The obi is showing some wear. 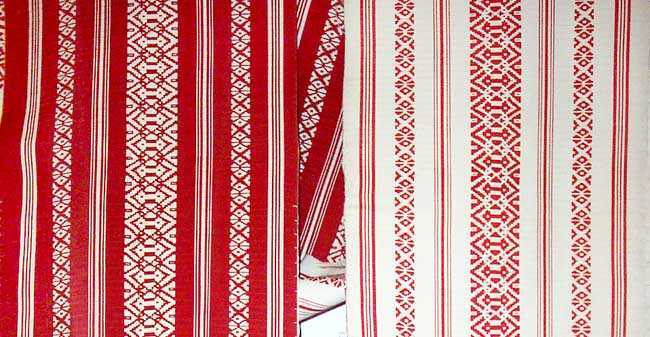 At one end it has one worn place 8 inches long where the sheer cloth has divided. This could be repaired. The edges are also frayed but these have been reinforced. We recommend this item for decoration or collecting. It probably could not take many wearings. Obi dimensions: 12 inches wide X 264 inches long.